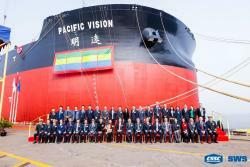 On 28 November 2018, Pacific Vision, the world’s first 400,000-ton ‘intelligent’ very large ore carrier (iVLOC), was named and delivered in Shanghai, heralding a new era in Chinese smart ships. Designed by the Shanghai Ship Research and Design Institute (SDARI) and built by Shanghai Waigaoqiao Shipbuilding Co Ltd (SWS), a subsidiary of China Shipbuilding Industry Corporation (CSSC), the vessel is owned by China Merchants Energy Shipping Co Ltd.
Pacific Vision has an overall length of 362m, a width of 65m, a depth of 30.4m, a draught of 23m, a speed of 14.5knots and a battery life of 25,500nm. The vessel was built around three major themes: common technology, key systems and demonstration applications. In following the China Classification Society’s (CCS) ‘Smart Ship Code’, the ship has realised five major ‘intelligent module’ functions: auxiliary automatic operation, energy efficiency management, equipment operation and maintenance, ship-to-shore communication, and cargo liquefaction monitoring. It also complies with international Ship Monitoring – Reporting – Verification (MRV) rules. On 28 November 2017, the world’s first intelligent merchant ship, the 38,800 DWT intelligent bulk carrier Great Intelligence (see February 2018’s The Naval Architect) was built by CSSC Huangpu Wenchong shipbuilding. The ship has broken through the key technologies of information sharing, self-assessment and decision-making, ship-to-shore integration, etc., and completed the independent development and integration of the whole ship intelligent network, intelligent operation and maintenance system, intelligent navigation system and host remote control system. The ship obtained CCS and Lloyd’s Register’s (LR) intelligent classification symbols. On the basis of Great Intelligence, Pacific Vision achieved breakthroughs in six aspects. First, the concept of ‘platform + application’ was proposed and applied to the ship. The platform unifies the collection, processing and analysis of ship operational data, providing it to each intelligent system to solve the problem of information duplication. Secondly, for the first time, collision avoidance decision support software has been applied, which provides the crew with anti-collision suggestions to help reduce navigational safety incidents and lays a technical foundation for the next step – independent/autonomous collision avoidance. The third breakthrough is the realisation of ship-to-ship communication, to enable direct communication between the ship and other ships at sea, further aiding collision avoidance. The fourth is the application of a cargo liquefaction monitoring function; by monitoring the degree of liquefaction of minerals in the cargo tank, including iron ore and nickel ore, it provides suggestions to the crew to solve ship stability problems. The fifth development regards effective transmission of ship-to-shore communication, with advanced encryption, which provides a reliable data source for the future construction of shore-based data centres. Sixth, the smart ship symbols of CCS and DNV GL were obtained at the same time. Pacific Vision is the first demonstration ship of China’s Intelligent Ship 1.0 Special Project, set up by the Ministry of Industry and Information Technology in 2016 to organise the primary institutions of the shipbuilding industry, intelligent system development units, shipbuilding groups, academic institutions, etc. to jointly carry out research on smart ships. CSSC is the organiser and main participant of the project. Waigaoqiao Shipbuilding (SWS), Shanghai Ship Research and Design Institute (SDARI), China Shipbuilding Systems Engineering Research Institute (SERI), together with China Merchants Energy Transportation, Beijing Hailanxin Data Technology, Shanghai ship industry leaders such as the Transportation Science Research Institute (SSSRI), CCS, and Harbin Engineering University, have taken advantage of their respective strengths to fully promote the research and development of the project. Industry experts said that the Intelligent Ship 1.0 Special Project will enhance China’s ability to design, build, operate, maintain and manage smart ships, as well as the autonomy, safety and controllability of core products. At the same time, via Great Intelligence and Pacific Vision, research on intelligent function modules and systems will drive coordinated development of the whole industry chain and enhance the comprehensive competitiveness of China’s shipbuilding industry.